Promoting my books throughout the blogosphere. Posted on April 27, 2012 by Mr. H Posted in Blog Tour, Hero's Guide	. Click here for my very first video interview, in which I answer questions from Misty, of TheBookRat.com. As is true of many people, I hate the way I look and sound on camera, so I, myself, won’t be viewing this interview any more. But by all means, please give if a go. In it, I reveal some teaser info about Hero’s Guide Book II. Posted on April 25, 2012 by Mr. H Posted in Blog Tour, Hero's Guide	. Posted on April 19, 2012 by Mr. H Posted in Blog Tour, Hero's Guide, Interviews with Me	. Click over to Muggle-Born.net for a behind-the-scenes look at the writing and editorial process of The Hero’s Guide to Saving Your Kingdom. It’s all part of the huge, multiple-website-spanning Fairy Tale Fortnight extravaganza. 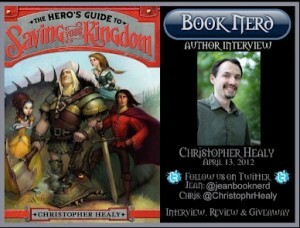 Posted on April 13, 2012 by Mr. H Posted in Blog Tour, Hero's Guide, Interviews with Me	. Learn all sorts of interesting things about me (like my love for oatmeal and Avatar: The Last Airbender) in this in-depth interview with Jean Vallesteros of Book Nerd. Meet Princess Lila in a New Exclusive Excerpt! Posted on April 5, 2012 by Mr. H Posted in Blog Tour, Hero's Guide	. In this exclusive Hero’s Guide excerpt on the blog, Mod Podge Bookshelf, you can be introduced to tween princess Lila, the only of Hero’s Guide’s heroes not to be based on a pre-existing classic character. Once again, the excerpt is accompanied by awesome artwork by Todd Harris. Posted on March 30, 2012 by Mr. H Posted in Blog Tour, Hero's Guide	. Zip over to Novel Novice (where I’ll also have an interview next month) to find an excerpt from The Hero’s Guide to Saving Your Kigndom. This snippet reveals some of the backstory between our Cinderella and, Frederic, her Prince Charming. It’s accompanied by more lovely art by Todd Harris. Posted on March 26, 2012 by Mr. H Posted in Blog Tour, Hero's Guide	. Two more fantastic book blogs have posted exclusive excerpts and sneak peek art reveals from The Hero’s Guide to Saving Your Kingdom. The first, on The Book Rat, details a bit of villainous backstory. The second, on A Backwards Story, gives you a glimpse of the might Prince Gustav in action. I hope you’re as blown away by Todd Harris’s illustrations as I was.